Progressive PAL video looks fine: where's the problem? In progressive PAL video, 4:2:0 chroma encoding is not reconstructed correctly by most codecs. This leads to jagged vertical lines similar to the comb pattern of interlaced video. Unless you are aware of the problem, it is often difficult to spot it. This also explains why it is still such an almost unknown issue. However, it seriously hampers chroma keying. The following image has been shot in progressive DV and is shown here at 400% magnification without interpolation to make the problem stand out. Look at the elf's left ear, where the issue is most visible, and also at her eyebrows. Luminance is correct, while chrominance is scrambled by several rows. When you know what to look for, the progressive bug is perceivable on every shot exhibiting color contrast. But when doing chroma key it will always stick out like a sore thumb. Just look at the image above. 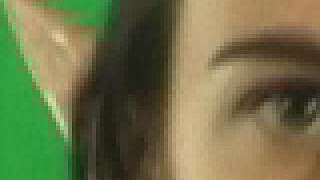 The matte on the left has been pulled straight from the buggy source footage, while the matte on the right has been pre-corrected to reorder chrominance scanlines. Hĺkan "Zap" Andersson comes to the rescue. In this thread he posted the link to his free, windows-only, plugin for After Effects that reorders chrominance scanlines. "Zap" Andersson is well know by the graphics community for being a Mental Ray developer and an all round visual effects artist. The plugin, which also works on Commotion and other hosts compatible with After Effects, produces the correct result shown in the right side of above image. All you have to do is to save the .aex file into After Effects'' plugins directory. The plugin will appear in Effects menu, under Zaps Plugins. Apply it to the footage you want to correct. Make also sure that After Effects does not mis-interpret the footage as interlaced. To do this, choose Interpret Footage and make sure that fields options are set to none. In progressive PAL video, 4:2:0 chroma encoding is not reconstructed correctly by most codecs. They were designed with interlace in mind, and no one thought about progressive images. This leads to jagged vertical lines similar to the comb pattern of interlaced video because the stream is progressive, but the coded thinks it's interlaced - and in Pal chrominance samples are placed along different lines. So the chrominance lines are reconstructed in the wrong order. That's why it's known as Pal's chroma bug.